The 37.2 metre motor yacht Harun, listed for sale by Benjamin Bensahel at G-Yachts, has had a €3,000,000 price reduction. Built in planked mahogany and marine plywood by Turkish yard Harun to RINA class, she was delivered in June 2015. Accommodation is for 10 guests in five luxurious cabins consisting of a main deck master suite with a king sized bed and private access to the Jacuzzi located on the bow, a VIP suite with a queen sized bed, two doubles with queen sized beds and a twin, all with LED television sets, entertainment systems and full en suite facilities. In addition, six crew are accommodated in three cabins. The large upper deck saloon on this yacht for sale is warm and welcoming and decorated in a bright, modern theme with comfortable seating, a bar and a state of the art entertainment system including a 46 inch Samsung HD 3D television. Forward is a formal dining area with seating for 10 guests. Al fresco entertainment and dining is available on the sun deck with a Jacuzzi tub, large sun beds and dining for 10 guests while the foredeck Jacuzzi has upholstered L-shaped seating and a dining table. Twin MAN 1,200hp engines give her a range of 1,200 miles at her cruising speed of 12 knots and she is fitted with Trac zero speed stabilisers to eliminate roll motion at sea and in port. 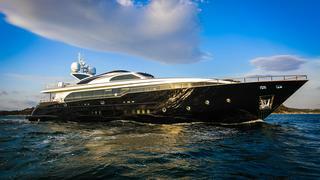 On display at the Monaco Yacht Show, Harun is now asking €8 million.